Close, who does not accept commissions, has previously sold his art at auction to raise funds for the campaigns of Hillary Clinton and Al Gore, and has created celebrated tapestry portraits of various friends and contemporaries including Vice President Gore and artists such as Roy Lichtenstein, Philip Glass, and Cindy Sherman. 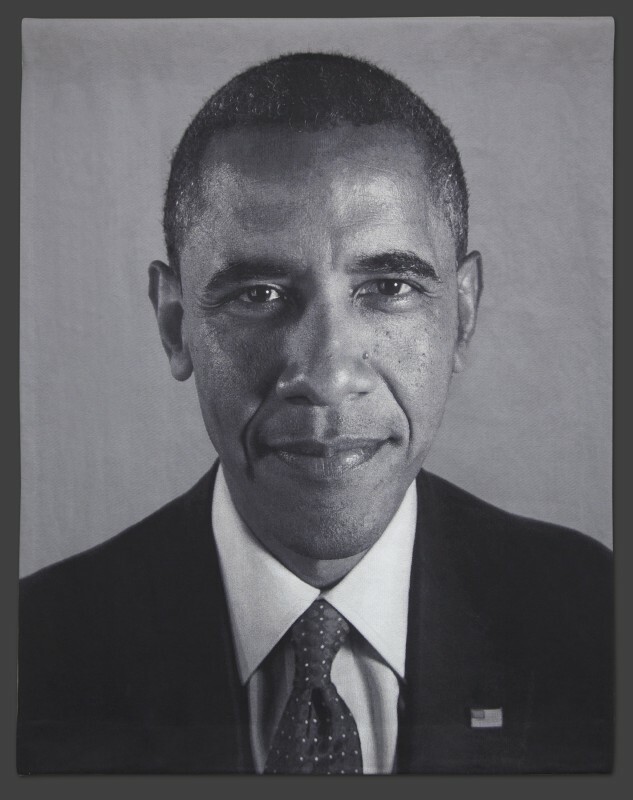 After being appointed to the President’s Committee on the Arts and the Humanities, Close offered to photograph Obama and was subsequently allotted an eight minute visit with the President to create a portrait. Fortunately, Obama ended up staying at the session for over an hour, in part because of the time needed to switch to the black and white camera Close uses to create photographs for his tapestries. The first tapestry portrait from this sitting, Obama 2012 (I), was unveiled at the Mint Museum in North Carolina in early September in honor of the Democratic National Convention. Close’s two tapestry portraits of the President, Obama 2012 (I) and Obama 2012 (II), are black and white portraits woven from Polaroid photographs; they are editions of 10, priced at $100,000 each. The editions on paper are archival watercolor prints, issued in three sizes and based on the same color Polaroid image. The small prints are an edition of 200 priced at $5,000 each; the medium-sized prints are an edition of 40 priced at $25,000 each; and the large prints are an edition of 10, priced at $50,000 each. A number of the prints have been signed by both Close and the President. All of the works were created by Chuck Close in collaboration with Magnolia Editions director Donald Farnsworth.